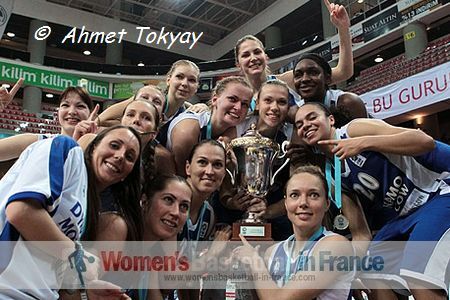 The 2014 edition of the EuroCup Women starts on 7 November 2013 with the group phase. FIBA Europe officially confirmed before the draw that the teams were split into two conferences according to their geographical placement. By splitting the participating teams into two regions there are four groups in Conference 1 and three groups in Conference 2. The purpose of doing this is to reduce the travelling and administration costs for the teams. All the French teams are drawn in the same pool and are going to meet each other in the first phase. In Conference 2 the Russian and Turkish Federations are represented by five teams. So there is one group with two teams from Turkey and another group with two teams from Russia. The 28 clubs registered for the upcoming season were divided in two Conferences (1 and 2) based on geographical criteria and seven First Round groups of four teams each. The top two teams from each group and the two best third-placed teams will advance to the Eighth-Finals. The competition starts on 7 November. All postseason match-ups, from the Eighth-Finals to the Finals will be played over two legs (home and away). The Final will be played over two legs on 20 and 27 March 2014.